We all know that negotiation — the act of getting what you want when the other side wants the opposite — breeds anxiety and stress. Negotiating is analytical but also emotional and so requires people to understand their opposition, including their desires and their beliefs about the world. But how can we get that kind of deep understanding? How can we foster empathy on both sides of a negotiation? If we can foster more understanding, will we make negotiations less stressful and more satisfying? Does it improve the outcome? Researchers at Stanford recently studied how to deepen a person's understanding of an opposing party, and how that affects the anxiety and satisfaction of a negotiation. The researchers created a simulation that worked like a computer game and then staged different interventions to determine the best way to foster "social perspective taking" (SPT), the technical term for viewing a situation from another point of view. See a thorough background on social perspective taking here: (Davis, 1996 [Amazon]). The authors set up their study to take a piece of canonical negotiating advice — walk a mile in another's shoes — and worked to make that a part of preparing for a negotiation. The researchers ran 842 participants through a simulation game – The player took on the role of an owner of a golf course who wants to maximize profits and the opposition was a park ranger, who wanted to minimize the golf course's environmental impact. Group 1: A control group. No learning about the other side. Group 2: Presented instructions to "think about the other side’s point of view" as they negotiated. Group 6: A "virtual shoes" condition where players spent 4-5 minutes walking around as the opposition, meeting her constituents and interacting with these characters using multiple-choice and open-ended responses. The script for this condition mirrored exactly the rich mental stimulation condition above (but it was interactive, not just passive). The researchers measured the outcomes in in two ways: Players earned commission based on what they negotiated with the opposing side. The researchers assigned points and dollar values to the negotiation points (e.g., which points did they 'win' vs compromise on). And also, players were asked a battery of questions to determine their negotiation relationship, including: "Overall, how much fun was the process of negotiating with the ranger?" and "How confident were you that you could stick up for yourself during the negotiation?" Results of the studies were powerful, both in participant satisfaction and in how much the player compromised with the opposing side. 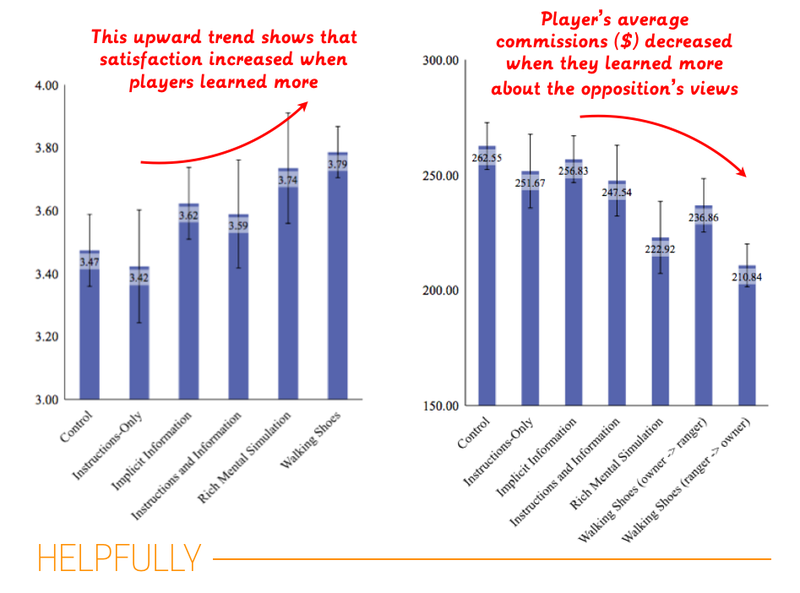 As they negotiated, players were less anxious, and felt more enjoyment when they spent time considering (either actively or passively) other's perspectives. As an example, the control group that was given no instructions or perspective-taking experience rated their satisfaction of the negotiation relationship as 3.47 (average, out of a 5 point scale). The group given instructions only rated their satisfaction 3.42 on average. But when they walked in other's shoes ("virtual shoes" condition), they rated it as 3.79, an improvement that's statistically significant. Players earned smaller commissions the more they learned about the other side's perspective. When the authors compared between groups, they did find that there was almost no difference between the two conditions that required the most learning about the other group (the virtual shoes participants earned quite similar commissions to those who got 'rich mental simulation' instead). The researchers show a controlled and experimentally valid version of common sense — creating empathy for the other side of a negotiation improves negotiation outcomes and improves the player's satisfaction, too. They attempted to prove that if you learn about the opposing side of a negotiation in a experiential, it would be create deeper understanding (and empathy) than just imagining or passive learning. But the researchers were surprised by the similarity between the "Rich Mental Simulation" script-based learning and the more immersive "Virtual Shoes" condition. Their hunch is that more immersive experiences, i.e., a Virtual Reality headset, may create a significant difference. "As virtual experiences become more perceptually realistic, the efficacy of these systems will improve and perhaps different results will emerge between virtual [experience] and imaginative perspective taking types." This study shows how to create a laboratory study of a sophisticated phenomenon. It suggests some guidelines for how to test hypotheses about negotiating, given the breadth of levels on which people engage in negotiation.